Berliner cablenet playground equipment manufactured in NY PA MD NY Wash. DC. 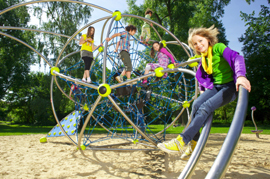 Are the children using your facility tired of traditional playground equipment? 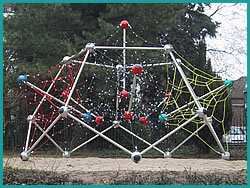 Designed for Fun recommends taking a close look at cable net play equipment from Berliner. Berliner Seilfabrik has been building cable net playground structures for over 30 years, with installations worldwide. As a manufacturer of steel cable since 1865, they are the industry leader in quality and innovative design. Berliner’s technical expertise and creativity form the foundation for their extremely well engineered playground systems. As members of the American Society for Testing and Materials (ASTM) and the German and European standard committees for sports and play equipment, Berliner ensures that all of their playground equipment confirms to the applicable national and local safety guidelines. One huge standout among Berliner many strengths is their ability to custom design a play environment that can include play components from several of their main "families" of play events. Berliner’s modular systems makes is easy to combine tall spatial climbing nets with inclined net bridges or horizontal planar nets. Add in a hand-over-hand ladder for upper body development or even a hammock net for a brief rest from the fun! 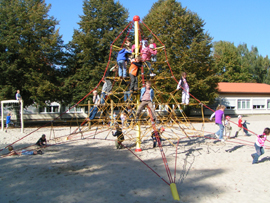 Check out the Berliner website at www.berliner-playequipment.com for more detailed information on the complete array of unique cable net play equipment from Berliner. For additional equipment ideas from Berliner, see their newest line, Urban Design Berlin.